Using data gathered by the Event Horizon Telescope, a network of radio telescopes spanning the globe, astrophysicists were able to piece together an image of a black hole positioned in the Messier 87 galaxy. More than 200 scientists have been working on the effort for over a decade. Because the supermassive target is so distant — 55 million light years from Earth — scientists required concurrent data from eight radio observatories around the world. Spanning four continents and Hawaii, the EHT is essentially an Earth-sized telescope tasked with capturing evidence of a black hole's accretion disc. More specifically, the telescope network detects radiation emitted by particles in the mass of cosmic matter as it swirls toward the event horizon, the edge of the black hole beyond which nothing can escape. While the black hole proper cannot be observed, the event horizon's shadow is set off against the comparatively bright accretion disc. In April 2017, weather conditions allowed the telescopes, coordinated by atomic clocks, to take simultaneous readings of M87, reports The Guardian. According to EHT, petabytes of raw data was recorded and stored on what ultimately amounted to a half ton of hard drives. Participating observatories include the Atacama Large Millimeter Array (ALMA) and Atacama Pathfinder Experiment (APEX) in Chile, the IRAM 30-meter Telescope in Spain, the James Clerk Maxwell Telescope (JCMT) and Submillimeter Array (SMA) in Hawaii, the Kitt Peak Telescope in Arizona, the Large Millimeter Telescope Alfonso Serrano (LMT) in Mexico, the Greenland Telescope (GLT) and the South Pole Telescope (SPT). Gathering the data took years of preparation and a bit of luck, but combining that information necessitated the creation of completely new technology. 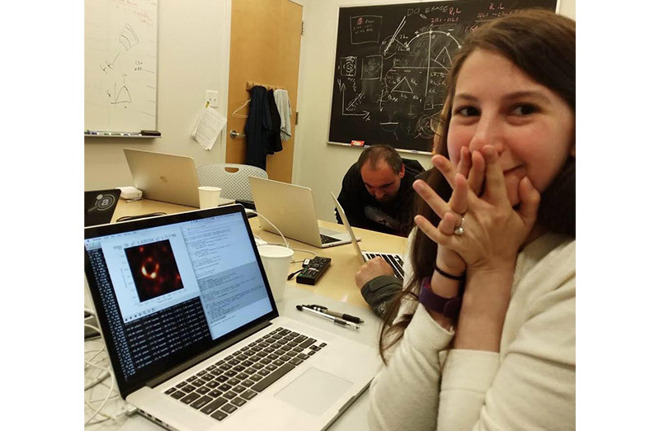 Enter Katie Bouman, who as a graduate student in computer science at the Massachusetts Institute of Technology three years ago led a team of researchers in creating an algorithm robust enough to compile the EHT data. The software, running on highly specialized supercomputers at the Max Planck Institute for Radio Astronomy and MIT Haystack Observatory, was fed the radio telescope data last summer and slowly processed the image seen above. "We all watched as the images appeared on our computers," Bouman said in a statement to Time. "The ring came so easily. It was unbelievable."